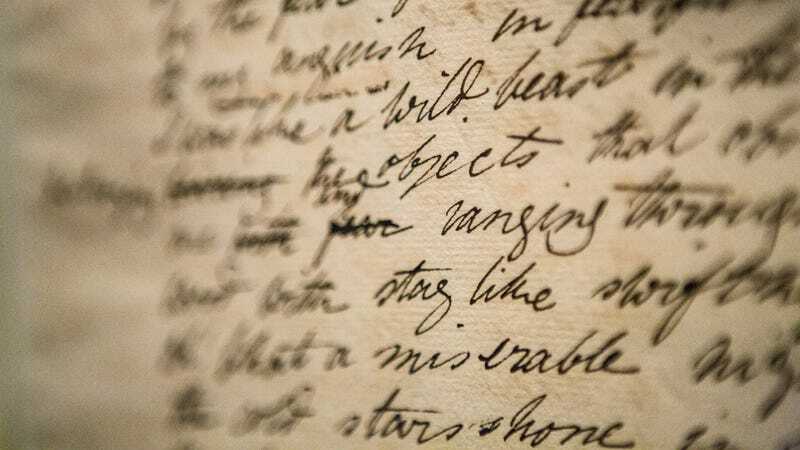 A new exhibit at the Rosenbach rare book library in Philadelphia explores the science underpinning Mary Shelly’s Frankenstein and Bram Stoker’s Dracula, two classic gothic novels that share a connection to the notorious “year without a summer” that followed Mount Tambora’s 1815 eruption. Showcasing handwritten notes from the original manuscripts, as well as other important books and manuscripts from the same period, Frankenstein & Dracula: Gothic Monsters, Modern Science relates the scientific and ethical dilemmas explored in 19th century gothic horror to some of society’s most pressing problems today. Those include infectious disease outbreaks and catastrophic climate change, both of which civilization grappled with during the year without a summer. Historical documents relating to Dracula and Frankenstein are placed in the context of modern science at a rare manuscript exhibit in Philadelphia. During the summer of 1816—about a year after the eruption—Mary Wollstonecraft, her soon-to-be husband Percy Shelley, Lord Byron, and their friends found themselves holed up at the Villa Diodati, a mansion overlooking Lake Geneva in Switzerland. Confined to the house because of the wretched weather, one night Lord Byron dared everyone to write down the scariest story they could think of. Wollstonecraft took on the challenge gamely, and wrote the beginning of what would become Frankenstein, the famous tale of a young scientist who creates a monstrous, but intelligent being that winds up ruining his life. Lord Byron’s story, The Fragment, became the inspiration for John Polidori’s The Vampyre, the first modern vampire story. “They were really using this time to create, because they were [forced to be] indoors,” Guston said. Decades later, Stoker borrowed themes from Polidori’s vampire story to help build the characters and world of Dracula, which became the quintessential vampire tale. There’s also evidence that the year without a summer, and the ensuing get-together at Villa Diodati—which Stoker knew about and referenced in his notes—helped to shape the story of the bloodsucking Transylvanian Count more directly. According to Guston, Count Dracula originally met his demise when a volcano erupted beneath his castle. John Polidori’s The Vampyre is considered the first modern vampire story. Some of the themes explored in Frankenstein and Dracula are also relevant to debates over how to respond to environmental challenges today. As society slowly grapples with the energy and economic shifts required to halt global warming, scientists are beginning to suggest more rapid technological interventions—so-called geoengineering approaches. Proponents of these high-risk, high-reward tech fixes may find a cautionary tale in Frankenstein, which is essentially a story of overreaching scientific ambition resulting in tragedy. From Brahm Stoker’s notes and outline of Dracula. Dracula, an ancient, evil being that can control animals and humans alike, epitomizes the idea that nature can’t be tamed. Stoker’s tale was distinct from earlier vampire works in that it drew heavily on the emerging medical science of the late 19th century, including viral infections, which scientists were just beginning to discover and struggling greatly to combat. To give these themes of science versus nature a modern twist, an interactive portion of the exhibit allows visitors to combat a mosquito-borne illness, but with knowledge that their remedies can have unintended consequences. Or, visitors can try their hand at solar engineering, a popular geoengineering scheme that involves scattering sulfate particles into the stratosphere to cool the planet. Visitors can play around with the size of particles, their bond strength and reflectivity, and try to halt runaway climate change. This experiment can also backfire. “We wanted to help the public think about whether that’s a valid experiment or not,” Guston said. An interactive portion of the Gothic Monsters exhibit allows visitors to play around with geoengineering. Gothic Monsters, Modern Science doesn’t offer answers. But perhaps, it’ll leave you thinking about how 19th century tales of undead monsters offer insight into some of the most daunting challenges of the 21st century. I, for one, can’t help but wonder: If a short-term climate disaster in 1815 helped spawn some of humanity’s most celebrated works of horror, what sorts of monsters will a never-ending climate disaster create?